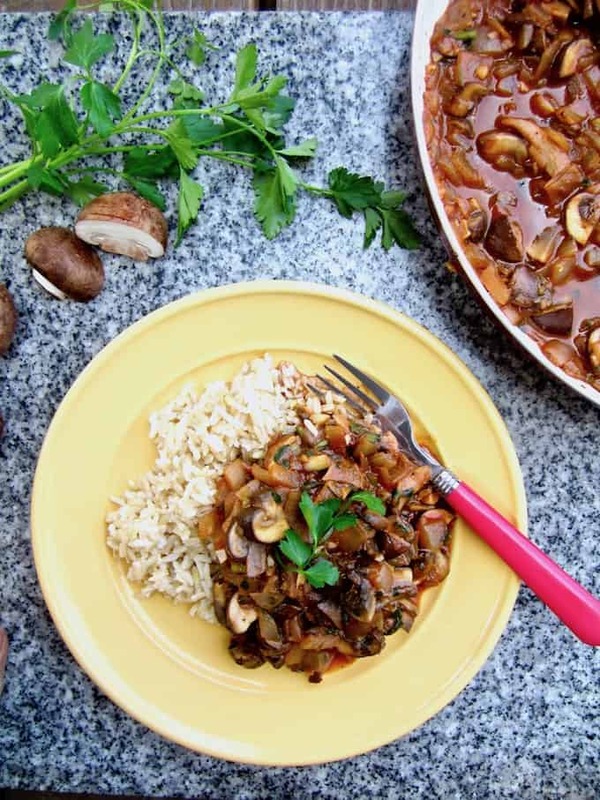 Mushroom Stroganoff + 'Vegan in 15' Cookbook Review! 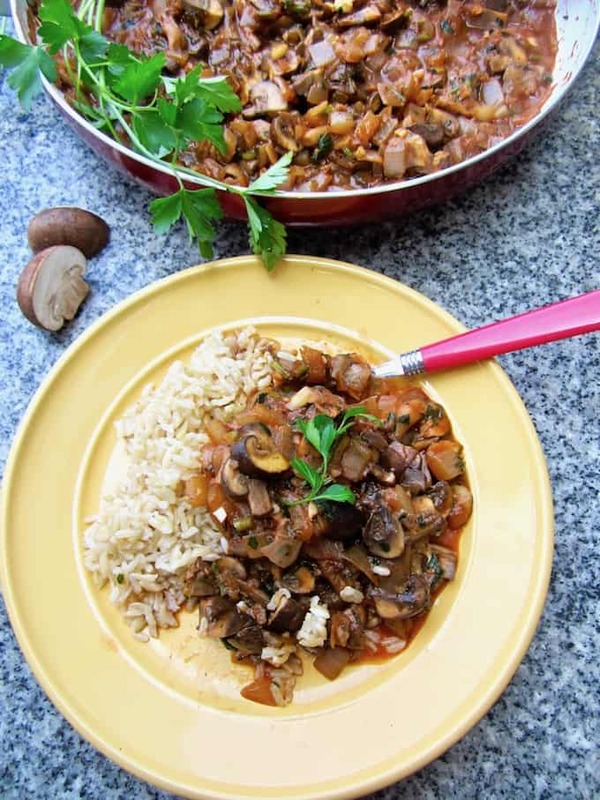 Mushroom Stroganoff + ‘Vegan in 15’ Cookbook Review! “I’m not here to tell you why you should eat less meat and dairy, nor why you should go vegan. Instead, if you are thinking about it, or have decided to do so, I hope simply to show you that you can eat incredibly tasty food that doesn’t take hours to prepare or involve trips to multiple health food shops for obscure ingredients. These recipes aren’t gluten free, sugar free, low calorie, low carb, paleo or detoxing. They won’t necessarily give you an ‘inner glow’, a ‘bikini-ready beach body’ or cure medical ailments. They just offer really good food which is quick and easy to make, and which happens to be vegan. WHAT I LIKE ABOUT THE RECIPES AND CONTENT: The recipes on the whole are very simple; hence the name Vegan in 15. For people who either don’t like to cook or don’t have time to cook, I think this book provides a lot of great ideas and shortcuts by using ingredients like ready-chopped garlic and ginger and pre-cooked rice. 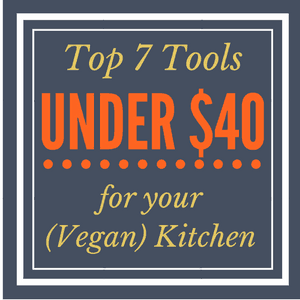 Kate also provides some tips on how to go vegan, cook vegan and shop vegan, as well as a list of common ingredients you’ll want to stock your pantry with. MY OPINION: For the most part, I like to use fresh ingredients. To me, nothing beats the flavors of fresh herbs and spices! Therefore I substituted ingredients like fresh garlic and ginger in the recipes I tried, which was an easy swap. I also personally keep my cooking largely ‘clean’, unprocessed and use whole foods as often as possible. Kate seems to use ingredients like sugar, flour and prepackaged items more often than my preferences, yet not in huge amounts, and again, it’s easy to substitute her recipes for fresh ingredients instead if that’s your thing too. I’m not sure all of the recipes can actually be done in 15 minutes though; seems like a bit of a stretch when you take the time to chop, cook, etc. – yet with the pre-done ingredients I would guess that many of them can be assembled in about 20 minutes or so. FYI: Since this is a gluten free blog, please note that not all recipes are gluten free, but many are or can be substituted to be so. WHAT I LIKE ABOUT THE STYLE: The book is small and light so can be taken anywhere with you (it easily fit into my carry-on luggage to peruse while I’ve been traveling recently), and therefore doesn’t take up a lot of space like some other bulkier cookbooks. MY OPINION: The book is a paperback with just a handful of pictures, which honestly was not what I was expecting when I received it in the mail. Personally, one of the appeals of having a cookbook in my hands is to see the big, beautiful pictures – so if this is important to you, then take this into account when deciding if you want to order this book. I also like bigger books so that they naturally stay open when following along with the recipes, versus having to hold the small book in my hand and opening it up again and again when cooking. That said, the recipes are pretty easy so don’t require frequent reference back to the book as compared to other, more extensive cookbooks. I think this cookbook is suitable for new vegans, particularly those who lead a busy lifestyle and don’t want to spend much time in the kitchen. For those of us who like to cook and work with whole foods as much as possible, I think this book can provide inspiration for easy meals when we don’t feel like going all out with our cooking and want to keep things simple. If you want a copy of Vegan in 15, order it here on Amazon ! 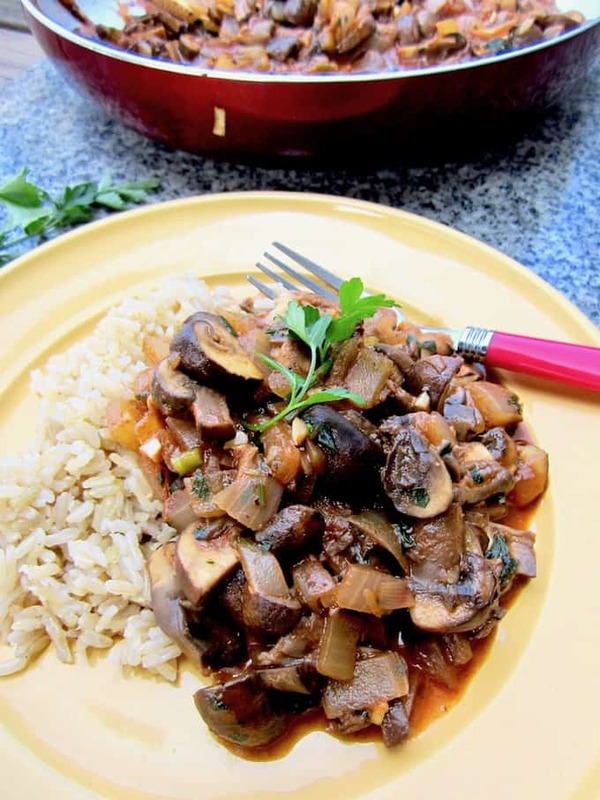 The recipe I decided to try for this post is Kate’s Portobello Mushroom Stroganoff. I made some tweaks to the recipe and I doubled it as well. Overall I was happy with the outcome, though I think I would prefer it over pasta or zucchini noodles instead of rice next time. A healthier and lighter take on the classic recipe, plus a review of the ‘Vegan in 15’ Cookbook! Heat a large frying pan on medium-high heat and add the oil. Add onions to the pan. (Note: original recipe says to add the garlic here, but I prefer adding it later to get more of the flavor punch, right before adding the wine). When the onions are softened, add mushrooms to the pan. Sprinkle the chili powder in the pan, season well to taste with salt and black pepper, and stir to combine. 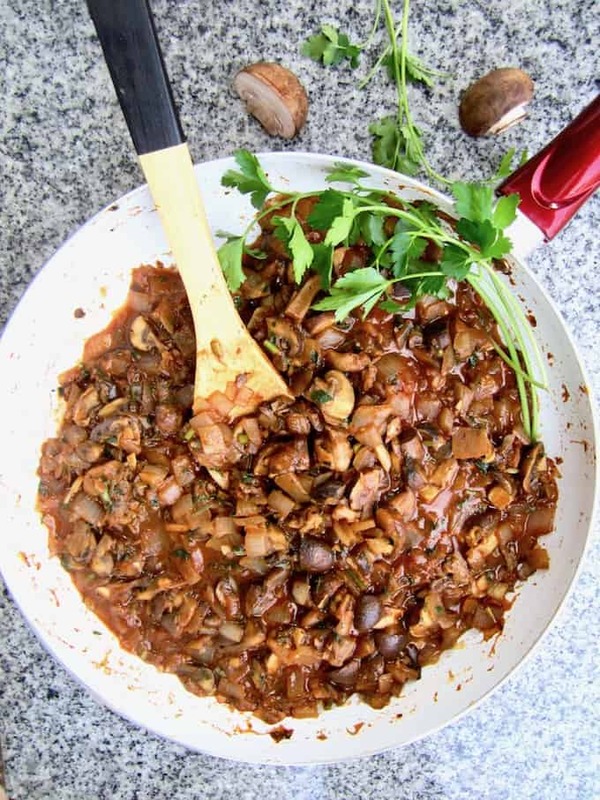 Cook for 4-5 minutes until the mushrooms are starting to soften and release their juices. Add the garlic, stir, and then add the white wine and bring the pan to the boil. Then after a minute add the tomato puree, water and stock powder. Cook for 2-3 minutes, then add the milk and continue to cook until the sauce has reduced a little. Meanwhile, cook the rice according to packet instructions if using precooked reheatable. Stir the parsley through the stroganoff, and serve it on a bed of rice. A great review, it's good to know that vegan food doesn't have to take hours! the mushroom stroganoff looks really good!